Is it too early to get our Christmas trousers out of storage? You know, those gloriously forgiving ones with an elasticated waist – perfect for those times when you’ve indulged in one too many roast potatoes, mince pies and Quality Street* chocs. Well, that’s the dilemma facing We Are Chester this week as we prepare to carry out the mouthwatering task of helping to judge which burger will win the title of #BurgerOff King of Burgers. Yes, we know, it’s a tough job, but somebody’s got to do it. A group of chefs from 10 restaurants and pubs across Chester are set to compete in the contest as part of the OctoberFest taking place at Hoole Community Centre on Saturday. 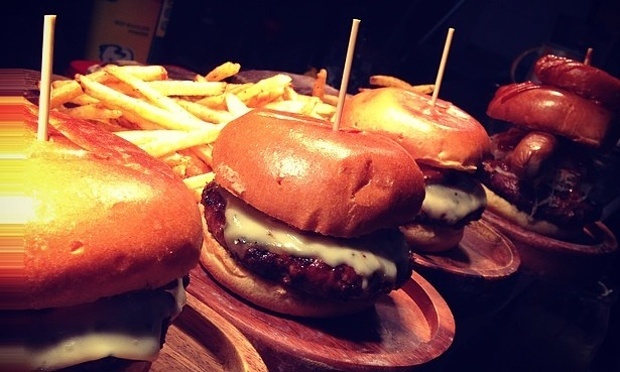 The rather catchily-titled #BurgerOff contest has been organised by Chester independent brewery and pub Kash Tap Rooms. And the heat will be on for chefs from Chester establishments The Mockingbird Taproom, the Oaklands, Luke’s Eating House and Gin Rickey’s, the Chef’s Table, Joseph Benjamin, the Bridge Inn, Moules a Go Go, the Piper, the Lodge Bar and the Hollows as they are challenged to come up with the burger to beat all other burgers in the contest. The entries for the King of Burgers contest will be judged by a crack team of local dignitaries, celebrities and bloggers, including the Lord Mayor of Chester Cllr Hugo Deynem, Dee 106.3 drive time presenter Gavin Matthews and yours truly from We Are Chester. Competitors will also be taking part in a freestyle contest to find the best alternative take on a burger. Live music on the day will come from 3Kings and we are assured that there will also be some Oom-pah songs being played, surely a prerequisite of every OctoberFest gathering. Beer on offer will including German beers along with Cheshire-produced brews. The event starts at 2pm on Saturday (3 October) and runs through until 10.30pm. Limited tickets priced at £1 will be available on the door. Advance tickets are available from Kash Tap Rooms on Brook Street, Chester Beer and Wine on Charles Street and Hoole Community Centre on Westminster Road (Mon-Fri 9-12pm). Now, where did we put those Christmas trousers? *Other festive chocs are available!